← Brexit and workers’ rights: Give me a break! To their credit – and that is not something I tend to say very often – Tory ministers appear to have been stung into action by revelations that large, profitable companies such as B&Q, Morrisons, Tesco and Caffe Nero are using this month’s hike in the minimum wage rate (for those aged 25 and over) to cut overtime rates and other basic entitlements, leaving many low-paid workers worse off. Well, it must be a tad galling to have corporate fat cats – to whom you’ve just gifted yet another cut in corporation tax – piss on your fantabulous national living wage parade. I wish to conclude by making this proposal to [MPs on all sides of the House]: please bring to me [and to the chancellor, George Osborne] any case of a company that seems to be trying to evade the spirit of the legislation in an unreasonable way. I am talking about companies that are profitable and will be benefiting from the dramatic cut in corporation tax, and companies that will be benefiting from the employer allowance or from the cuts in business rates. Bring those cases to me and I promise that we will use the full force of our office to put pressure on those companies to live up not only to their legal obligations, which are our job to set out in making legislation in this House, but to their moral obligations, which are the ones we feel matter a great deal more. And on Tuesday, seemingly having woken up to the unfortunate consequences of what shadow BIS minister Kevin Brennan described in Monday’s debate as “the Great Osborno [pulling] a rabbit out of his hat, to the delight of his misdirected audience on the Conservative benches”, the chancellor himself went on TV to warn employers not to cut perks to pay for his dishonestly-named ‘national living wage’. Time will tell how many MPs take up the chancellor’s offer, and how many profitable but miserably penny-pinching employers then feel sufficiently ashamed to ‘do the right thing’. 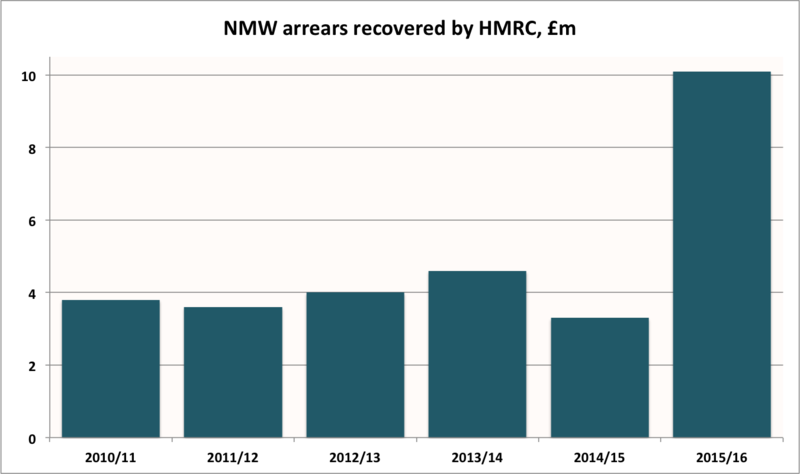 But there was more good news from Nick Boles during Monday’s debate, as he announced that the budget for enforcement of the minimum wage by HMRC has increased from £13.2m in 2015/16, to a whopping £20m in 2016/17. As the minister gleefully noted, that is considerably more than twice what the supposedly worker-friendly Labour government devoted to such enforcement (a mere £8.3m) in its last year in power. Interestingly, Boles also confirmed that, in 2015/16, HMRC recovered “more than £10 million of arrears for more than 58,000 workers”. As the minister could not contain himself from noting, that is “three times the arrears identified in 2014/5, and for twice as many workers”. This is to be welcomed. But – as previously noted on this blog – it also begs a question: how did this stonkingly good performance by HMRC come about? For it is not easily explained by previous, much less dramatic increases in the HMRC enforcement team’s budget. Could it possibly have something to do with the (effective) amnesty for NMW rogues that BIS quietly announced in the summer of 2015? We really should be told. This entry was posted in Workers' rights and tagged Enforcement, National living wage, National minimum wage, NMW. Bookmark the permalink.